The viscous nature of airflow reduces the local velocities on a surface and is responsible for skin friction. As discussed earlier in the chapter, the layer of air over the wing’s surface that is slowed down or stopped by viscosity is the boundary layer. There are two different types of boundary layer flow: laminar and turbulent. Vortex generators are used to delay or prevent shock wave induced boundary layer separation encountered in transonic flight. They are small low aspect ratio airfoils placed at a 12° to 15° AOA to the airstream. Usually spaced a few inches apart along the wing ahead of the ailerons or other control surfaces, vortex generators create a vortex that mixes the boundary airflow with the high energy airflow just above the surface. This produces higher surface velocities and increases the energy of the boundary layer. 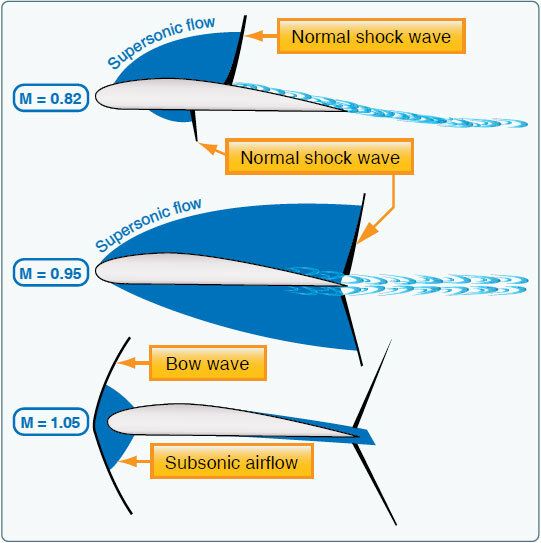 Thus, a stronger shock wave is necessary to produce airflow separation.